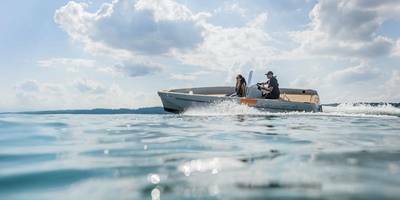 The German manufacturer of electric outboards Torqeedo provided the integrated propulsion system for the world’s first electric-powered freefall lifeboat, which is being built by the Dutch builder Verhoef. The rugged system is designed to withstand the heavy g forces of freefall launch and provide 30 minutes at full speed, followed by 10 additional hours at 50 percent of maximum speed. The electric system also includes an inverter to drive a water spray pump, which is a requirement in case the craft drives through burning oil on the water’s surface.